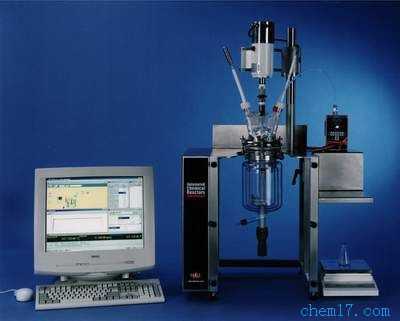 A reaction calorimeter is a tool that allows for the precise simulation and thermal study of a chemistry and associated plant, typically at the one litre scale. simular reaction calorimetry ...an essential tool for process r&d a reaction calorimeter is a tool that allows for the precise simulation and thermal study of a chemistry and associated plant, typically at the one litre scale. subsequently, important safety, viability and optimisation data can be obtained prior to scale up. safe process scale-up the most common application of a reaction calorimeter is the determination of heat released during a process. from this the subsequent cooling duty required for scale up can be calculated. in addition the potential adiabatic temperature rise can be calculated. combined with other techniques, a basis for safety can therefore be determined. further inion available includes the determination of reagent accumulation and the impact of variables such as agitation and catalyst upon the reaction rate. by changing feed rates and batch temperature, the optimum operating conditions for both efficiency and product quality, can be determined. flexibility without compromise simular is built around our unique modular electronics and the latest in-house developed windows software, to provide you with a tool that meets your requirements, both now, and into the future. se-lect the components that most closely match your plant conditions, then combine them to have a dedicated, simple-to operate tool that simulates your plant and process.this includes temperature range, agitation, speed, reagent feed rate and even reactor geometry - find out why we offer the best, most flexible, reaction calorimeter for your application. multiple calorimetric methods unlike most leading reaction calorimeters, simular is designed to be used by research chemists and safety specialists alike.this is made possible by power compensation calorimetry, unique to the simular.this allows accurate determination of heat release without the need for time-consuming calibration or complex calculation procedures. for more conservative users, the classical heat flow calorimetry method is also supported as standard. why simular flexible: whether it is the wide temperature options,multiple reagent feeds or reactor specifications, no other system covers such a wide range of chemical conditions and variables. powerful: simular is the only reaction calorimeter to offer heat flow, power compensation and reflux calorimetric techniques. each of which offers specific advantages depending on your chemistry, and all are available regardless of reactor specification. expandable: the modularity of simular systems allows you to add on to your system - feeds, sensors etc - in the future simply and without major cost implications. ease of ownership: the system will fit into existing fume hoods and usually needs only existing power supplies.we also have the most innovative and user friendly software, and use the standard laboratory components that you are already familiar with. don’t configure your chemistry to suit your equipment - se-lect the simular to suit your chemistry.specification turnkey systems: for safe and efficient scale up, it is essential that your tools simulate your plant as closely as possible. in addition it is important that as much inion and insight as possible about the process be obtained. as such the options, upgrades and flexibility offered by the simular are almost limitless, and we put them all together in a turnkey and dedicated solution. reactors: the standard reactor is a 1 litre glass, atmospheric pressure system. optional volumes range from 0.2 to 20 litres in glass, stainless steel or resistant alloy, with pressure ratings up to 200 bar. specialist geometries and custom designed vessels are available to simulate real plant conditions. feeds: reagent feeds - gas, liquid and solids feeds are all available using a variety of application dependent techniques. standard liquid feeds are pump and balance combinations, but options include syringe pumps for low flow rate feeds and pressurised vessels for faster rates and/or highly volatile reagents. gas feeds can be controlled via constant reactor pressure, bottle/balance combinations or even mass flow control. finally automated solids addition is also made possible using a screw feed system developed exclusively by hel. operating range: pressure - hel offer a range of options for the study of reactions under pressure including 6 and 12 bar glass reactors, 60 bar stainless steel with a number of other alloys and specialist material options. we even produce systems that operate at up to 200 bar reactor pressure. temperature - by using commercially available heater/chiller systems, we can offer you the temperature range you need, between -80 and over 350°c, with precision of better than +/-0.1°c. these systems also offer a small foot print and emergency cooling is available when required. controls & sensors: software and electronics allow a variety of inputs to be logged and if necessary, used for feedback control. this includes ph, turbidity, conductivity, ftir, particle size etc. sampling: hel have developed tools for automatic sampling and dilution during chemical reactions. a portable sampler, software driven, is available as an option. calorimetric methods: only simular offers you three different methods of reaction calorimetry. heat flow is the most widely used method, and is standard on all simular systems. heat generated by the reaction is removed by the oil jacket, and by using precise calibration heaters, pre and post reaction, the energy evolved can be determined. reflux calorimetry allows for the determination of heat flow even during large changes in reflux temperature and reactant volume. power compensation is a method that bypasses the need for the lengthy calibration steps involved in heat flow. advantages: reduced experiment time • intuitive ""live"" results • improved temperature control. running experiments: winiso has been developed in-house to provide a logical and simple interface for describing multiple step processes. using input screens, arranged in a series of “recipe cards", the operator simply indicates the required set point for each peripheral. each step is then terminated on any se-lected conditions, (e.g. temperature, time, feeds completed), or by a series of logic statements. during operation, all conditions are displayed on a mimic, numerically and on a trend graph. all steps can also be modified during operation. changes are fully documented in the output file. inion obtained: all process variables such as pressure, temperature, ph, feed rate etc, can be stored on disc for off-line analysis as well as being displayed in real-time. formal calorimetric data is obtained by off-line calculation using our proprietary iq software package. this includes reaction enthalpy, heat release rate, heat transfer rate etc.